Some of the most beautiful views in the world are found 25 miles to the east of Portland along the Columbia River. 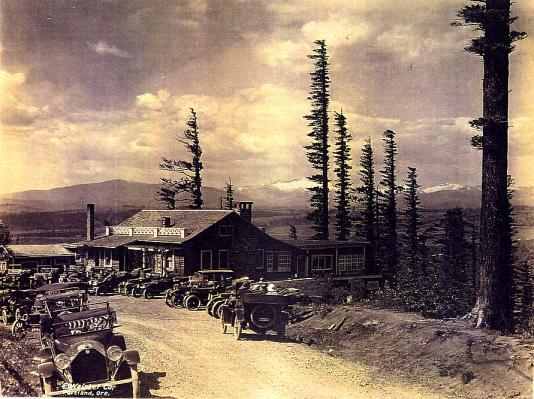 The unpaved Columbia River Highway opened in 1915, after several “Roadhouses” sprung up along the Columbia River. These Roadhouses served the best food, they gave the weary travelers a place to get refreshed and they offered up breath-taking views of the Columbia River Gorge. A “roadhouse” is defined as anything from a post card shop to a motel where travelers could stay overnight. Gasoline Stations, garages, fruit stands, flower booths, lunch counters, candy stands, ice cream parlors as well as film and photo shops dot the highway every few miles. But a drive out the highway would not be complete without a fine dinner at one of the large and popular inns. The rich and famous people of the day from Hollywood to the East Coast made it to Chanticleer Inn, Crown Point Chalet, Forest Hall, Multnomah Falls Lodge or the Columbia Gorge Hotel. Before the days of freeways, roadhouses lined some of Oregon’s most scenic highways. The Chanticleer Inn was built in 1912. 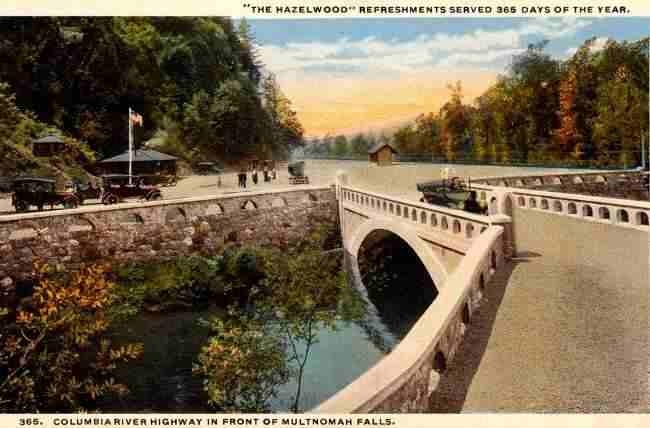 This view is from 1916. This view of Chanticleer clearly shows the expanded dining room where the porch was enlarged and enclosed on the right. Chanticleer burned down October 8, 1930. 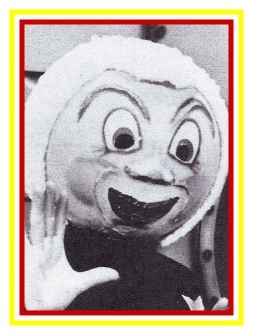 When you think of Columbia River Roadhouses, you think of Mrs. M.E. (Margaret) Henderson. 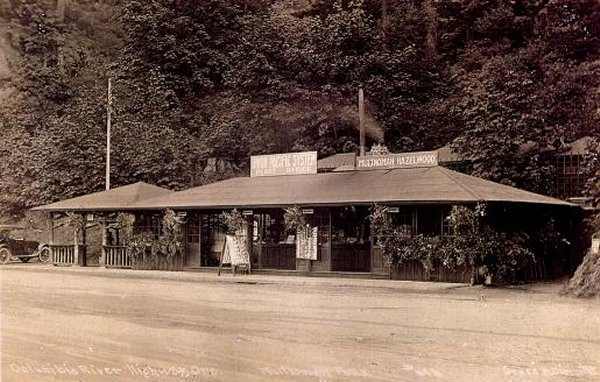 Famous for her chicken dinners and gracious hospitality, Mrs. Henderson was probably the most influential entrepreneur in the history of Columbia River Highway Roadhouses. Mrs. Henderson was a partner in and managed the Chanticleer Inn when it opened in 1912. The highway hadn’t been built yet, and access to the Inn was usually by taking a train or riding in a boat up the Columbia River from Portland. Then there was either a long steep walk or a ride in a horse-drawn coach. Mrs. Margaret Elizabeth (Bidy) Henderson was known for her generous and kind heart and would go out of her way to help others. While Mrs. Henderson managed the Chanticleer Inn, her cooking skills and hospitality built her a reputation that was known far and wide. Her meals became so popular and the Inn attracted so much traffic, that an improved road was eventually built. Dignitaries from all over the world traveled to experience her extraordinary hospitality. Mrs. Henderson made a very significant contribution to the development of the Columbia River Highway. She didn’t want her guests to drink and drive, so she had a policy that liquor would not be served in her eating establishments. 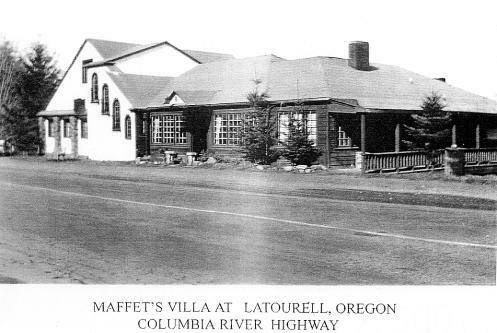 Leaving the Chanticleer Inn to have her own eating establishment, Mrs. Henderson built the short-lived Latourell Falls Chalet in 1914 and it was an immediate success. Unfortunately, it burned just three months after opening and she lost everything, including a fine library and handcrafted furniture. With her ambitious spirit and strong determination, Mrs. Henderson, or Bidy, as she was called, set out almost immediately to build again. 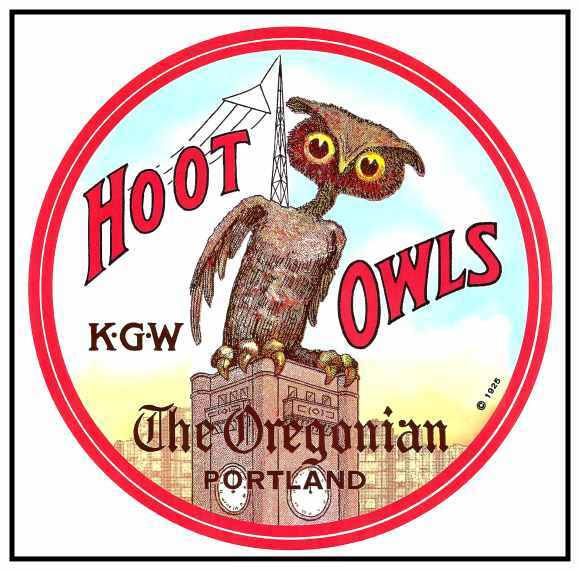 Bidy enlisted the help of many of Portland’s prominent businessmen, who bought $20 dinner books. This time, she chose a spot overlooking picturesque Crown Point and christened the new establishment The Crown Point Chalet. 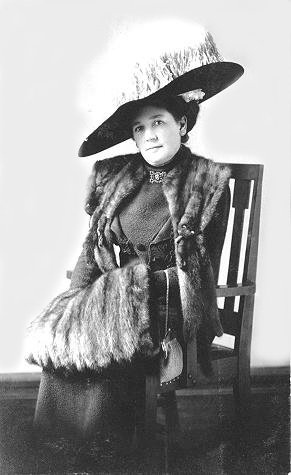 Opening the Crown Point Chalet on May 15, 1915, Mrs. Henderson quickly affirmed her ability to attract the rich and famous. 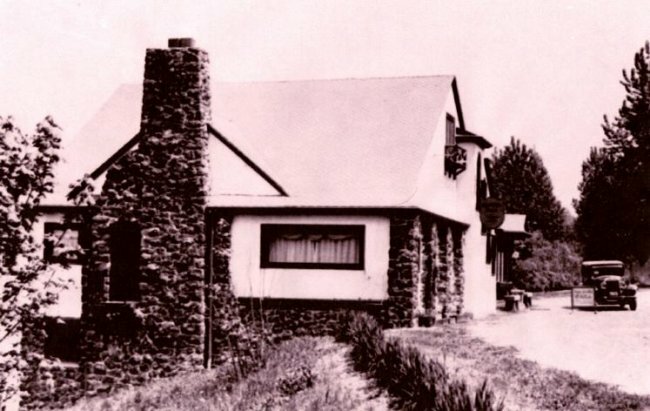 Dignitaries far and wide would make their way to the Crown Point Chalet to experience Mrs. Henderson’s legendary hospitality and country-fried chicken served in the ambiance of a mountain chalet. In December, the first winter it was open, the roof blew off and it was quickly replaced. An early interior view of the beautiful Crown Point Chalet, which was designed and furnished by Mrs. Henderson. Failing health caused Mrs. Henderson to sell the Chalet in 1927. Moving to Portland, Mrs. Henderson opened a modest Third Floor Dining Room on Alder Street. She died at the age of 58 in 1930 after battling a chronic kidney infection. The guest books of the Crown Point Chalet have survived and they contain over 73,000 entries of satisfied patrons. Among them were Henry Kaiser, Frank Woolworth, Mrs. Marshall Field, Eddie Rickenbacker, Cornelius Vanderbilt Jr., Fatty Arbuckle, Charlie Chaplin, Henry Ford, Jack Pickford and Harold Lloyd. Eventually, the long-vacant, deteriorated building was demolished in the 1950’s. 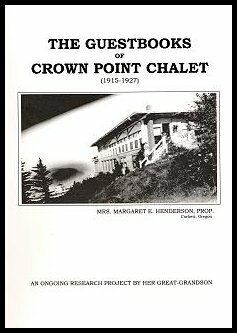 Mrs. Henderson’s great-grandson, Cliff Nelson of Benicia, California, has compiled a history of the Crown Point Chalet and he has researched the names of the many dignitaries listed in the Guest Books. He is opening up a treasure chest of information by documenting the history surrounding the Chalet’s many guests. He has published a limited-edition book to record his progress. He has also uploaded his work to a new website at www.crownpointchalet.com. My thanks to Cliff for providing and verifying some of our information. in a "most limited edition"
Gardiner’s Cafe’, which opened in 1922 as Johnson’s Confectionary, sat next to the Vista House. In later years it was known as Vista Cafe’. It was torn down by the Forest Service in 1963. Forest Hall, which was built in 1915, is shown shortly after completion. The building is now a private residence.